Imagery from NASA's Aqua satellite captured a wide-eyed Typhoon Rammasun as it was making landfall in northern Hainan Island, China early on July 18. A rainfall analysis using another NASA satellite showed the flooding potential of the storm as it left the Philippines and headed for China. Now, Rammasun is headed for a final landfall near the northeastern border of Vietnam and China. On July 17, an analysis of Typhoon Rammasun's rainfall was conducted at NASA's Goddard Space Flight Center in Greenbelt, Maryland. The rainfall analysis covered the storm's rainfall from July 10 to 17. 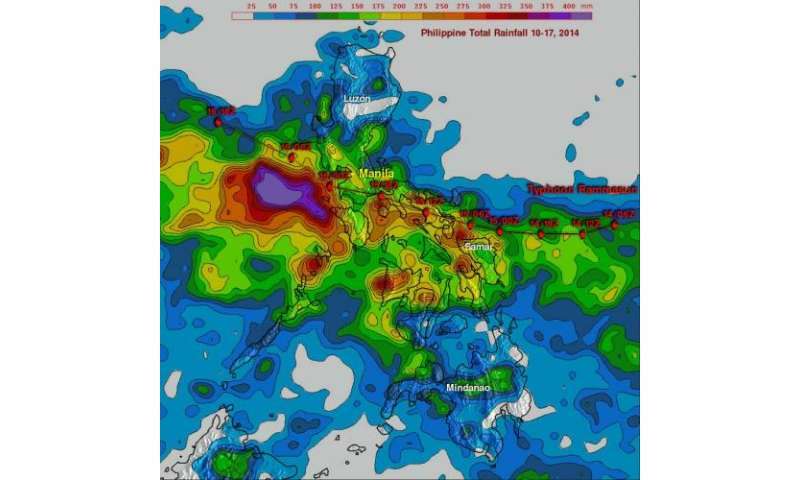 The Tropical Rainfall Measuring Mission or TRMM-calibrated merged global Multi-satellite Precipitation Analysis (TMPA) indicated that rainfall totals of over 325 mm (about 12.8 inches) occurred in many parts of the central Philippines as Rammasun swept through. Typhoon Rammasun passed to the south of the Philippine Capitol of Manila. Rainfall totals there were estimated to be greater than 200 mm (about 7.9 inches). Most of the Philippines were affected by Rammasun but northern Luzon and Mindanao received lower amounts of rainfall than locations closer to the typhoon's track. The highest rainfall totals of over 545 mm (about 21.5 inches) were found in the South China Sea southwest of Manila. On July 18 at 05:35 UTC (1:35 a.m. EDT) NASA's Aqua satellite flew over Typhoon Rammasun just as the eye of the storm was approaching Hainan Island, China. The MODIS instrument aboard Aqua captured an image of the storm that showed a clear eye, surrounded by bands of thunderstorms that extended into southern China's mainland, west into the Gulf of Tonkin, blanketing Hainan Island, and over the South China Sea. On July 18 at 0900 UTC (5 a.m. EDT) Rammasun had moved back over water in the Gulf of Tonkin and had strengthened back into a super typhoon. The Gulf of Tonkin is the body of water associated with the South China Sea that lies between Hainan Island, China and Vietnam. At that time, Rammasun's maximum sustained winds had increased back to 135 knots (155 mph/250 kph) making it a Category 4 hurricane on the Saffir-Simpson sc. Rammasun was centered near 20.2 north and 110.8 east, about 217 nautical miles (249.7 miles/401.9 km) southwest of Hong Kong. It was moving to the northwest at 12 knots (13.8 mph/22.2 kph) and generating very high waves in the Gulf. The Joint Typhoon Warning Center (JTWC) estimates 35-foot (10.6 meter) high seas. Hong Kong was still under Strong Wind Signal #3. 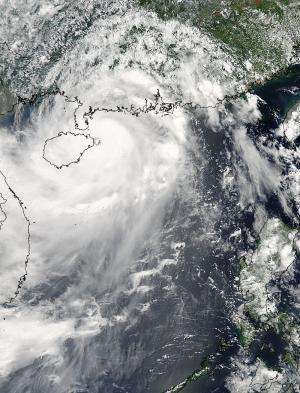 JTWC forecasters noted that animated multispectral and enhanced Infrared satellite imagery showed Rammasun's eye had become more organized, and cloud top temperatures cooled. Cooler cloud top temperatures indicate more uplift in a storm, pushing the clouds higher into the troposphere. The Joint Typhoon Warning Center expects Rammasun's final landfall just north of the China/Vietnam border around July 19 at 0000 UTC.